Or what if someone under consideration for a top White House job had written an admiring foreword for a book by Holocaust denier David Irving or perhaps one by the psychologist and alt-right sympathizer Kevin MacDonald, who describes Jews as “a hostile, adversary elite” conducting “ethnic war” against Christianity and “traditional institutions of European-American culture”? Would such an endorsement keep him from being named as the president’s national security adviser? Similarly, earlier this year when John Bolton was tapped to replace Lt. Gen. H.R. McMaster as President Trump’s national security adviser, numerous critics called attention to his associations with various anti-Muslim conspiracy theorists, including his enthusiastic foreword for a book by two leading Islamophobes, Pamela Geller and Robert Spencer (no relation to white nationalist Richard Spencer), filled with ominous insinuations about former President Barack Obama’s supposed Muslim ties. That book was titled The Post-American Presidency: The Obama Administration’s War on America. 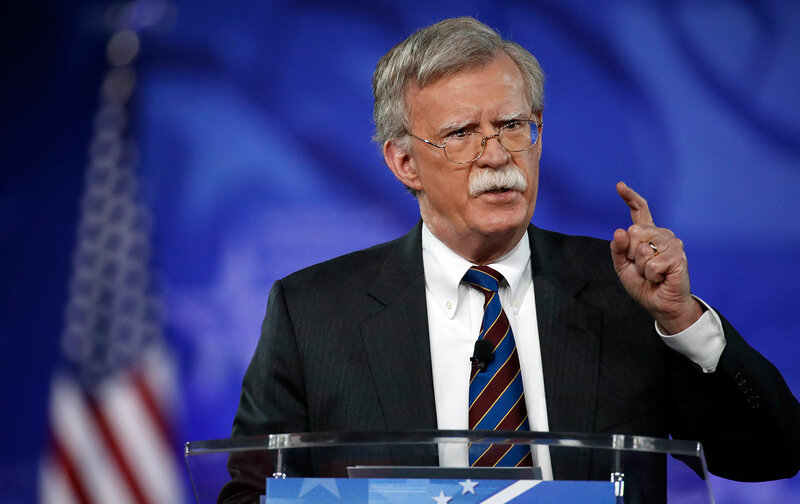 Bolton used the same label in the opening sentence of his foreword, which says: “Barack Obama is the first post-American president”—that is, not a real American president, which was the book’s central message. If a presidential candidate had proposed an equivalent policy directed against any other religious or racial minority—foreign Jews? Black Africans?—would his candidacy have survived? Not likely. It is difficult to imagine that someone who had taken that position could have stayed in the race at all, let alone won the election. Guandolo—whose publicity implies that he was forced out of the FBI for trying to speak truth to power about Islam, but who actually resigned after the bureau learned he’d had a sexual relationship with a witness in a case that had nothing to do with Islam or terrorism—is by no means universally accepted as a valid anti-terrorism expert. His record of offensive (not to say unhinged) statements is regularly recirculated by advocacy groups and cited in local media when he turns up somewhere to conduct training or promote his consulting business. Recently, the Texas Commission on Law Enforcement retroactively denied accreditation to a seminar Guandolo gave in that state in early May, declaring that his material “paints an entire religion with an overly broad brush.” But his views haven’t shut his business down, either. Despite adverse publicity, he continues to get contracts from law enforcement clients who, it is safe to say, would not dream of hiring a consultant expressing comparable views about African Americans or other minorities. The same can be said about the bigots themselves. They have plenty of critics, but have nonetheless gained an influential voice in the public dialogue—and have much more credibility than they deserve, given that their arguments are largely premised on false logic and provably phony evidence. To begin with, the Islamophobes’ description of sharia as a kind of official manual, a comprehensive “legal-political-military doctrine” spelling out a single set of rules that all Muslims are bound to obey, is wildly inaccurate. It bears no resemblance to the sharia that actually exists in Muslims’ lives, a constantly evolving guide to moral principles, religious practice, and personal conduct not formulated in any one document but drawn from many interpretations by scholars and religious thinkers across the Muslim world—the exact opposite of the “totalitarian socio-political doctrine” that the anti-sharia movement says Muslim infiltrators want to impose on the United States. Lastly, even if the conspiracy were real, it’s inconceivable that it could succeed. Consider, for instance, conservative evangelical Christians, who are perhaps a quarter of the national population (and broadly identify with the same faith as the large majority) and are politically influential out of proportion to their numbers. They have been unable to reverse court rulings on school prayer, abortion rights, and gay marriage, despite years of strenuous effort. And we are asked to believe that there is a realistic threat that a minority religious group making up 1 percent of the population—actually, as the authors of one critical commentary pointed out, a small extremist fraction of that 1 percent—could subvert the legal and governmental system and impose its “laws” on the other 99 percent? To any rational person, that is a ludicrous argument. But the conspiracy theorists have convinced a surprising number of people, including state legislators who have enacted anti-sharia laws in a dozen states and introduced similar legislation in many more. Simply putting it on the list along with identically formulated questions about school safety, illegal immigration, abortion, gun control, trade policy, and other subjects is a clear suggestion that the “spread of sharia law” is of equivalent public concern, a legitimate question for voters to consider. Moreover, since those taking the survey will presumably include many respondents who had not thought about the issue before, that question will undoubtedly plant that subject—and the fear that goes with it—in more minds. There’s no way to know if that question is on the survey because its designers or the Make America Great Committee fund-raisers who put it on the site actually thought of sharia as a real problem for Americans. Maybe they just saw it as a useful hot-button term that could help energize the voters and potential campaign donors they wanted to reach. Either way, it is yet another small but telling example of a broader reality: In today’s America, disparaging Islam is acceptable in ways that disparaging other religions is not (and make no mistake, spreading a grotesque caricature of sharia and condemning it as evil and dangerous is a slur on the Muslim faith).